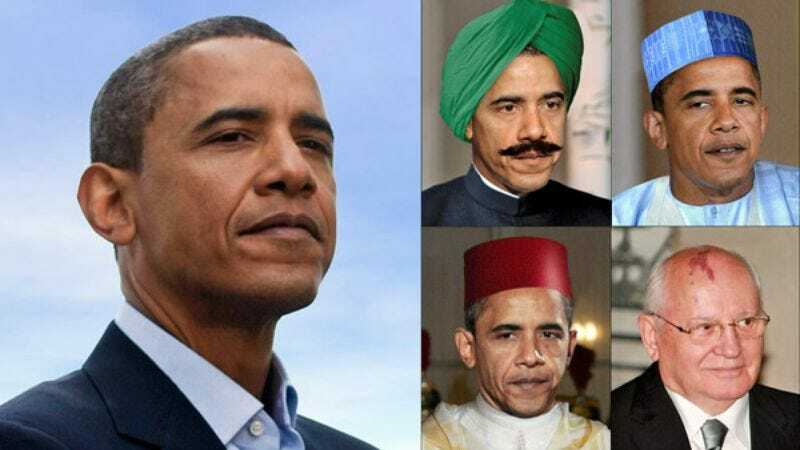 Barack Obama as he appeared to millions of Americans, along with four of the president-elect's former disguises. CHICAGO—In a devastating blow to millions of unsuspecting Americans, newly elected president and international con man Barack Obama fled the country Wednesday with nearly $85 million in campaign funds. According to FBI investigators, Obama's sudden disappearance was discovered at 6:15 p.m. when the former Illinois senator failed to arrive at a gala event in Lincoln Square, prompting several aides to rush back to his campaign headquarters. At 6:23 p.m., flight logs at O'Hare International Airport confirmed that two passengers, a male carrying two silver briefcases and dressed in a perfectly tailored Brioni tuxedo, and an African-American female wearing a fur coat and speaking in a thick Russian accent, were seen boarding a private plane. Click to read the note left behind by Obama, in which he claims the American public "never stood a chance." Obama's campaign office, sources said, was completely vacant aside from a discarded Abraham Lincoln portrait, behind which was an emptied safe that his aides claimed never to have seen before. In addition, three unconscious Secret Service agents were discovered at the scene, along with two lit cigarettes still burning in an ashtray, and Obama's daughters, who authorities now believe were taken from an Alabama foster home six years ago. The only item found inside the metal safe was a letter, handwritten with a fountain pen and titled "An Explanation, My Dears." "To my tender little pawns, the all-too-trusting people of America," said FBI lead investigator Ray Hilland, quoting the letter at a press conference Wednesday. "If you are reading this, then I have already left your silly country in my private jet, and am right now sipping fine champagne with my lovely associate, a woman you have come to know as 'Michelle.'" "I assure you, this was the most pleasurable and fulfilling con I have ever pulled off," the note continued. "Not since the Moroccan elections in 1984 have I taken so much joy in raising, and then crushing, the hopes and dreams of so many pathetic, disenfranchised, and downtrodden people." "It's been an absolute delight doing business with you. Rest assured, your generous contributions will be well spent," the note concluded. "Fondly yours, Ψ." After initiating a further search of his campaign office, officials found more than two dozen counterfeit passports inside Obama's desk drawer. Authorities suspect that this is not the first time that the man who inspired millions has preyed upon a leadership-starved country, raised a record amount of money by running for office, and then vanished without a trace. "This explains Portugal in '86, Finland in '94, and Greece in '90," CIA director Michael Hayden said. "He used the same faultless cover in those elections as he did here—a dead mother, a runaway father, a grandfather who fought in Patton's or Järnefelt's or Papdopoulous' army, and his signature calling card: change." Multiple translations of Obama's books Dreams From My Father and The Audacity Of Hope were also discovered at the scene, each seemingly authored by a different world leader, including former Malaysian president Mohamad Mahathir, former Belgian prime minister Jean-Luc Dehaene, and the 14th Dalai Lama. Of particular interest were the titles Les Rêves De Mon Père and L'audace D'espére, both of which feature a cover photo of French president Nicolas Sarkozy, a man Paris officials claim hasn't been seen or heard from in nearly eight months. According to investigators, it appears that over the past 15 years, Obama has been elected president or prime minister in nearly 45 countries, many of them African. Officials estimate that since 1983 Obama has amassed more than $2.3 billion in stolen campaign financing. "He's good, real good," Hayden said. "Sometimes he'll have three campaigns going on at once. Recently uncovered video of him in Bangladesh, Ukraine, and Italy in 1989 shows him shifting seamlessly between three languages. And no matter what dialect he speaks, he speaks it passionately. He also abides by a flawless formula: a desperate country, plus hope, plus the promise of a bold new tomorrow equals big bucks." "Hell, even I donated the $2,400 to his campaign," he added. Obama's closest aides, including head campaign strategist David Axelrod, admitted that they never once suspected their candidate was anyone other than who he claimed to be. Nevertheless, Axelrod said that the recent revelation did explain why he once overheard Michelle Obama tell her husband that "the time had come for their coup de grâce." "He completely suckered me," said a visibly dejected vice president-elect Joe Biden, who estimated that he raised over $10 million for Obama. "I trusted him. Change, 'Yes We Can,' a new kind of politics, bringing the nation together, valuing an open dialogue about the issues—I trusted all of it." Added Biden, "I should have known it was too good to be true." Everyday Americans, whom Obama referred to as "so many unwitting chess pieces in my elaborate game," also expressed shock Wednesday. "I'm devastated," Pennsylvania resident and Obama donor Denise Bell told reporters. "I just hope he comes back soon so he can be our president."